Like every year, Samsung launches many new devices this year, however, Samsung’s top of the line smartphones were the Galaxy Note 8 and the Galaxy S8 for the year. 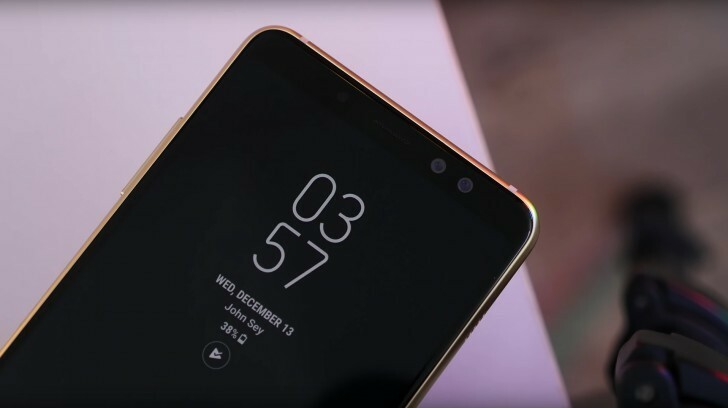 But in 2018 Samsung seems to be trying something new with its Galaxy A series smartphones by launching the Galaxy A8 2018 and the Galaxy A 8+ smartphone with Dual front-facing Cameras and both these devices are expected to be the most powerful Galaxy A devices of 2018. Samsung’s A series smartphones have been there for users who want quality phones with less pricing. With the Galaxy A8 2018 Samsung will be extending the Infinity Display with 18:9 aspect ratio on both the new Galaxy A8 and A8+ 2018 models. The Galaxy A8 2018 series follows the same curved glass design on the back and front; it sports a metal frame on the side. The Galaxy A8(2018) and A8 Plus (2018) will be available in four colours black, orchid grey, gold and blue. The device features a 5.6-inch FHD+ resolution (2220 x 1080 pixels) Super AMOLED display with 18:9 aspect ratio, an octa-core processor, coupled with 4GB of RAM. It will come with 32GB/64GB storage variants. Both devices run on Android Nougat 7.1.1 out of the box. The bigger Samsung Galaxy A8+(2018) sports a 6.0-inch FHD+ Super AMOLED display with (2220 x 1080) pixels resolution. The processor and RAM/Storage remains the same as A8. The Galaxy A8 packs a 3000 mAh battery, while the A8+ has a 3500 mAh battery. The Galaxy A8 (2018) measures 149.2 x 70.6 x 8.4 mm and it weighs 172g while the A8+ measures 159.9 x 75.7 x 8.3 mm and this weighs 191g. Both phones also support fast charging and come with USB Type-C support. In terms of connectivity, there is NFC, MST for payments, Wi-Fi 802.11 a/b/g/n/ac (2.4/5GHz), Bluetooth v 5.0 (LE up to 2Mbps), ANT+. Sensors on board the Galaxy A8 series for 2018 are: Accelerometer, Barometer, Fingerprint, Gyro, Geomagnetic sensor, Hall sensor, Proximity sensor and RGB Light sensor. The Galaxy A8/A8+ devices are expected to be announced at CES 2018 in January. No Indian and other pricing details are available as of now but, we could expect the pricing for these two devices around $500.